Another installment in the Nashville series. 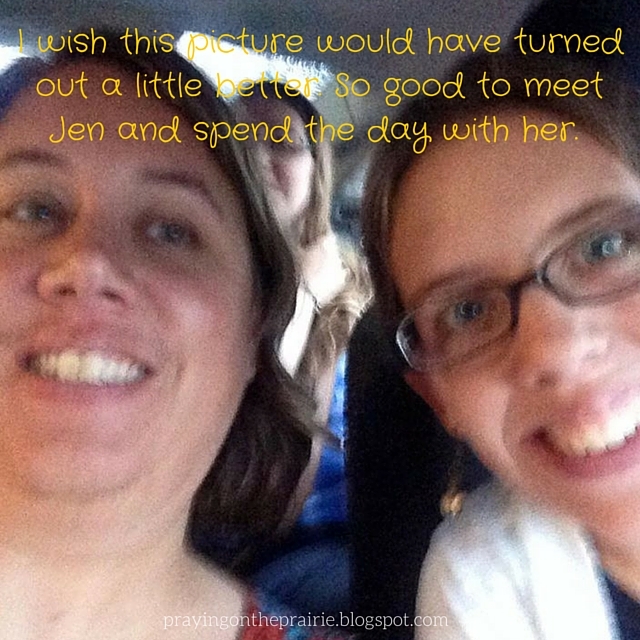 For those of you who are new to this blog, I have been recapping the sister’s trip that my sister Andrea and I took this summer. It was a blast. Hopefully these little nuggets will give you a little glimpse into how awesome this trip was—memories to last a lifetime! Ann and I decided to sleep in. About 10:45 am, I pulled back the covers and ran to the bathroom to take a quick little bathroom break. As I crawled back into bed, my phone almost immediately began to ring. My new blog friend Valerie was calling to see where I was at. Valerie and our other blog friend Janel were coming to Nashville for the first ever Five Minute Friday retreat. I gave Val directions to our hotel. Then I quickly jumped out of bed and began getting ready for the day. After about 20-30 minutes, I got another phone call telling me they had arrived. I yelled through the bathroom door to tell Ann I was running downstairs to get them. I stepped into the elevator and pushed the button for the 1st floor. However, God had a sense of humor that morning as the elevator kept climbing….6th, 7th, 8th and so on before it finally began descending to the first floor. I stepped off the elevator, turned right to the end of the short hallway, turned right again and soon my new friends were in my line of sight. Janel proclaimed, “There she is!” Valerie saw me, ran up to me and embraced me in the hugest hug. After our hug, I ran over to Janel and hugged her. Together the three of us walked to the elevator, stepped inside, and pushed the button for our floor. Once off the elevator, we walked to our room. Once inside, I introduced my new friends to my sister. We sat on the beds and chatted for awhile. Then we decided it was time to pick a lunch place. After perusing through the Nashville area recommended restaurants, we decided to head to Germantown and the Germantown Cafe. Our drive to the restaurant was an adventure as we wondered if Siri was giving us the right directions: around one curve, then another, until we finally arrived at the cafe. At the cafe, we checked in and waited for our table. We only waited a few minutes before our server came to seat us. We all looked over the menu. After awhile the waiter came and took our order. 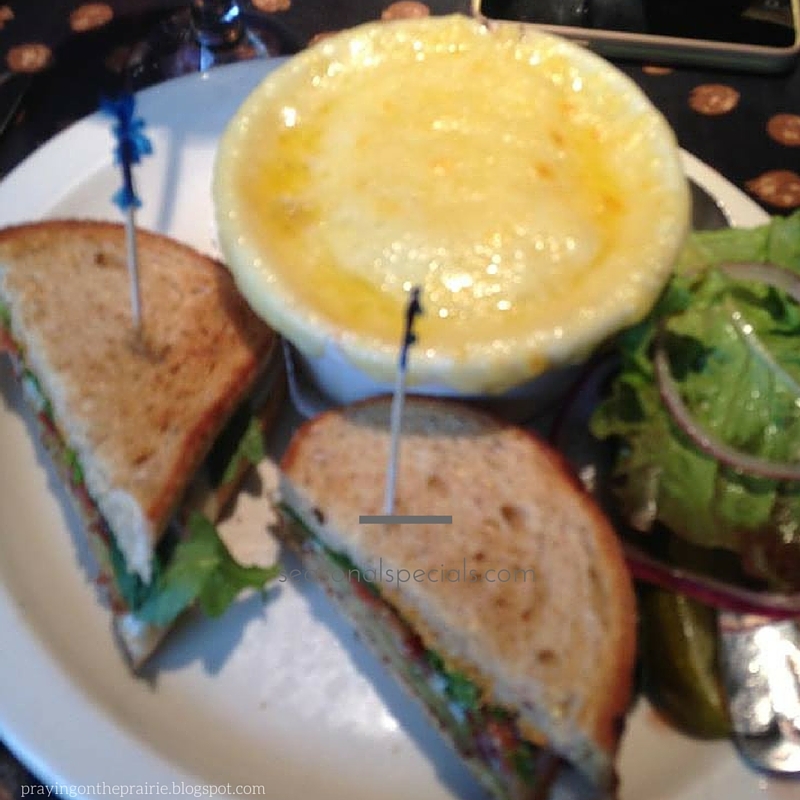 Val and I both ordered the same thing: the french onion soup with a fried green tomato sandwich. As we waited for our meal, we visited. It really was like we have known each other much longer than we have. Soon the waiter came with our meals and we all dug in. It was the most delicious french onion soup that I have had in a long time. The whole top of the soup was covered with ooey gooey cheese that melted in your mouth. The fried green tomato sandwich was yummy too! We all enjoyed our meals. The waiter came to take our plates away and of course, asked if we wanted some dessert. After a very brief moment of hesitation, we ordered the caramel apple dessert and a yummy chocolate dessert. They seriously were the most decadent desserts. I literally would have ate the whole caramel apple dessert if my friends would have let me. After our meal, we walked out to Val’s car. A beautiful flowering tree was blossoming in front of us. We stopped to take in the breathe and depth of God’s awesome creation. While we were enjoying the flowers, Val and Janel noticed a baby bird in the branches. We peaked through the branches until we spotted him. He looked so comfortable there…but then he soon decided to fly away. We all climbed back into Val’s car. Val and Janel dropped Ann and I off at our hotel. We went inside and I called for a Lyft driver to come pick us up. He said he would be there shortly. As we were getting ready to leave, Ann reminded me that I had wanted to change. So like the quick changers from a few seasons ago on America’s Got Talent, I changed as fast as I could. Our driver arrived. Ann and I got into the car and he drove us to Opryland. Ann and I sat and waited until the time for our tour arrived. Soon the clock struck 3:45 pm and Ann and I walked to the back door where the group of people going on our tour were waiting. The doors opened. We walked inside and sat down. The tour guide played us an introduction video featuring the one and only Blake Shelton. After the video, our tour began. We stood on the infamous circle where we had our picture taken. As we stood there, I couldn’t help but think of all the stars that had stood in that exact spot as they sang on the Grand Ole Opry. After everyone was done with their pictures, our tour guide took us backstage to see the dressing rooms. We continued down the hallways where our tour guide showed us all the dressing rooms. 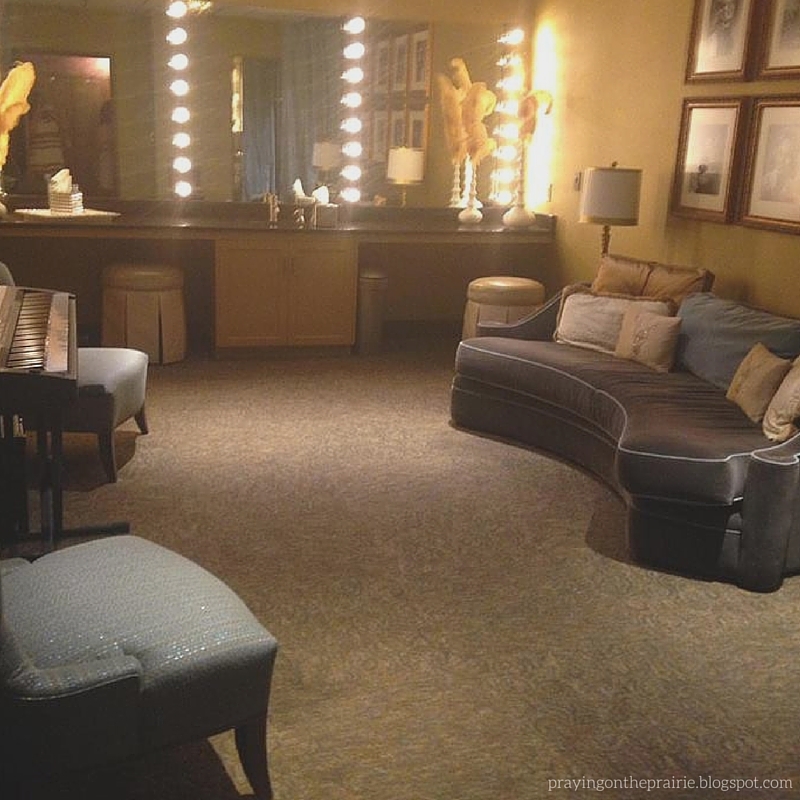 They are themed dressing rooms. There is the Stars and Stripes room which has an American flag painted on its wall. There is the Women of Country room. There is the It Takes Two room which is dedicated to the honor of country duos. And many many more rooms as well. After our tour, Ann and I walked across the street to the Opryland mall where we decided to have supper at an Aquarium restaurant. Ann and I looked over the menu and ordered our meal. As we were waiting, we watched the fish of all shapes and sizes swimming in the tank. Our meal soon arrived. Ann and I ate our meal and then walked back across the street. We waited for the doors to open. Then we found our seats. They were in the balcony; second row or so right in the center. We waited for the show to begin. Soon several Congregational Medal of Honor honorees were led to their seats. Throughout the night, these men and women were honored for their service to our country. The show began. Jeannie Seely soon walked onto stage. Then a bluegrass band played for us. After 30 minutes, a short break was had and then the next section began. We heard from Pam Tillis, Mark Wills, Mel Tillis, The Gaither Brothers, Raelyn and so many more. The show ended. Ann and I walked outside with the swarm of people. I plugged in my phone as the battery was dying so that I could call for a Lyft driver to come pick us up. We waited on the curb for him to arrive. He finally arrived and drove us back to our hotel. We got out of the car, thanked him for our ride, and walked into the main lobby of our hotel. We rode the elevator up to our hotel room. Then Ann and I took the time to carefully pack all of our new souvenirs so nothing would get broken on the plane ride home. After everything was carefully packed away, we both crawled into our beds but not before I took one last look at the Fitbit. We had walked 7,416 steps; 3.19 miles; burned 2,304 calories and had been active for 23 minutes. As we laid our heads down for the night, Ann and I were both sad that our trip was coming to an end. Memories to last a lifetime! We woke up to a very wet day. Ann and I got ready for our day and walked to the Country Music Hall of Fame and Museum which was directly behind our hotel. However due to some road construction, we had to take the roundabout way to arrive there. Ann and I arrived at the Museum at 8:45 am. The doors didn’t open until 9 am. Ann and I waited under a small awning by the doors with a dad and his teenager daughter. Soon it was 9 am and the doors were opened. Ann and I along with the Dad and daughter immediately got in line. We received our sound devices that we could play as we worked our way through the museum. The device was our tour guide. We showed our ticket to the worker, got inside the elevator, and the worker pushed the button for the second floor. We stepped off of the elevator and into the beginning of the museum. As we stepped off, directly in front of us was the Taylor Swift Education room. From there we moved along to Trisha Yearwood Parkway where there was the wedding dress and the reception dress she wore when she married Garth Brooks. We continued to work our way through the museum. 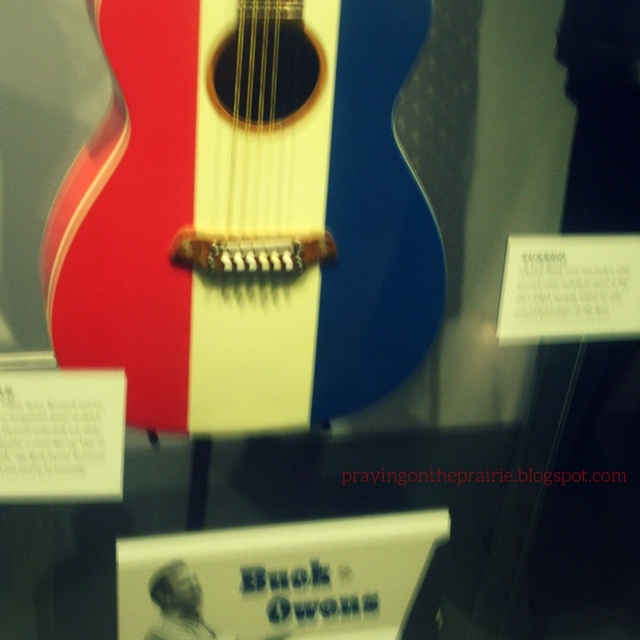 There was so much to see: Elvis beloved car, his gold piano, the set from Hee Haw, Buck Owen’s red, white, and blue guitar, and so much more. Ann and I wound our way around the third floor of the museum. Then we took the staircase down to the second floor where we again saw so much more. We spotted the special Luke Bryan exhibit which Ann had been waiting all week to see. We learned that his real name is “Thomas Luther Bryan.” We quickly finished looking through the museum before we had to go downstairs and wait for our bus to RCA Studio B. We rode the elevator down to the front lobby and then waited for the bus to come. 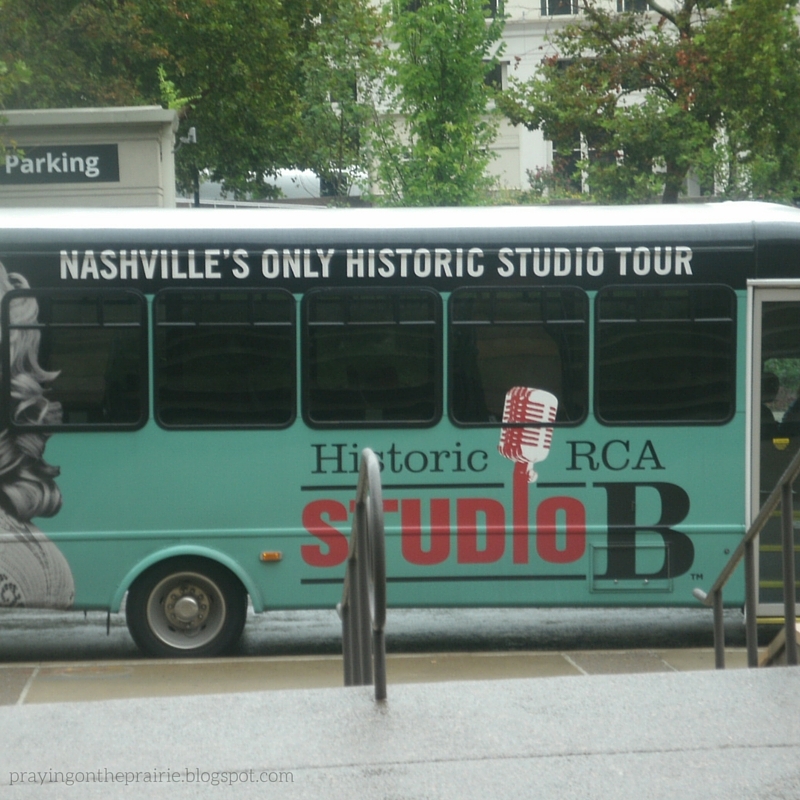 Soon a teal bus with the words Historic Studio B on it along with a picture of Dolly Parton pulled up. We got on the bus, found a seat and sat down. On the way to the studio, our tour guide gave us a brief history of the studio. Soon we arrived at the studio. The tour guide allowed us a little bit of time to take our pictures in front of the studio. We all gathered in the first room of the studio. We picked out a few musicians who recorded at Studio B: Charlie Pride and a few others. Then she told us about them. We also listened to some music from Elvis and other Studio B musicians. We walked through the hallway and turned into a room on our right. It was the originally recording studio. Once inside, we all took in the sights and sounds of this room. Dolly Parton’s original recording of “Jolene” filled the room. Goosebumps appeared on my skin as I continued to take in these historic sights and sounds. The tour guide pointed out to us that all of the items except the drum set were original to the building. After awhile, we all sat down and our tour guide continued to tell us about this historic space. After awhile, we all climbed back onto the bus. Looking out our window, fresh rain drops on it, we took one final photo of this historic place. 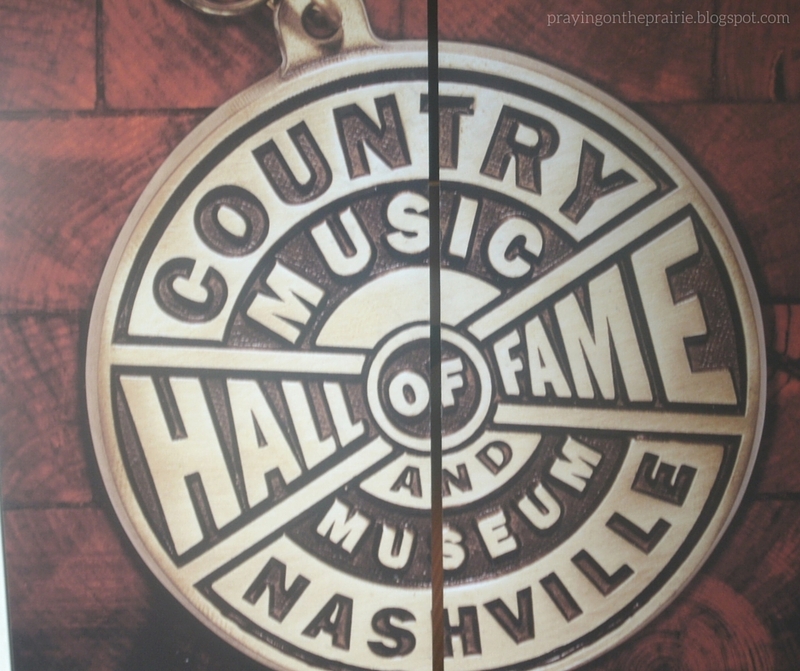 We went back to the Country Music Hall of Fame and Museum. Ann and I went back to the second floor and finished out the tour. On this floor, there was many interactive stations. We sang karaoke. Then we created our own cd covers. Along the way there was a giant guitar. Ann and I each took turns sticking our faces in the sound hole and snapping a quick photo. We finished at the museum and walked into the Hall of Fame which is in a round. The words “The circle will never be unbroken” hung on the wall in the Hall of Fame. We stood and took in the names of all the musicians that have been inducted into the Hall of Fame. Once we finished at the Hall of Fame, Ann and decided to check out their gift shop. After awhile, we didn’t find anything, so we walked back to our hotel where we decided to chill out for a little while. Towards dinner time, Ann and I walked to the Wildhorse Saloon. We walked inside and were greeted by a statue of a wild horse. We checked in and then soon were seated at a table. We looked over the menu. Ann and I decided to split a meal. It was the yummiest sausage I have had in a long time. While eating our meal, they invited individuals up to learn line dancing. Ann and I both decided to give it a try. After a short period of time, I looked over and Ann was standing on the sidelines videoing me. I tried my very best to keep up with everyone, but it seemed like I was always a step or two off. After the lessons, I returned to our table. We finished our meal. 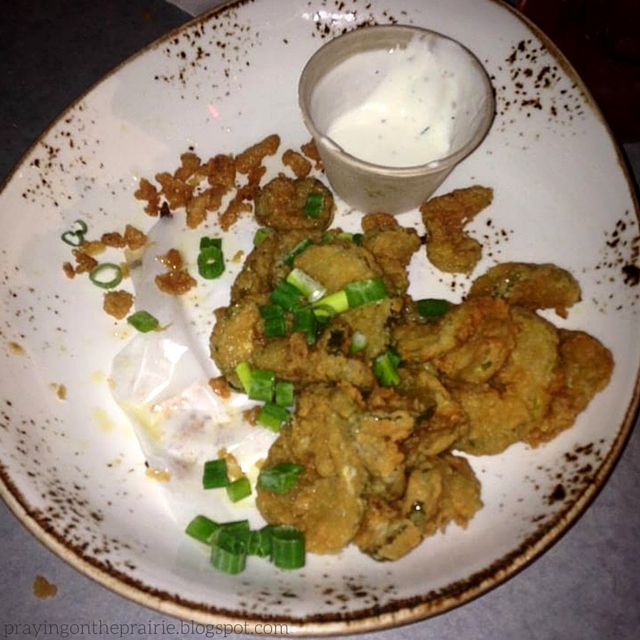 Then we decided to try the fried pickles. They soon arrived. Ann and I each took a pickle and dipped it in the dipping sauce. We continued to munch on them as we listened to the band Brother Trouble. They were good, but there was many of them so we didn’t finish our plate. After receiving our souvenir glasses, Ann and I walked back to our hotel. While on our way back, we saw that there was a musicians showcase at the Johnny Cash Museum. Ann and I went inside but not before making a gentlemen move that was parked right in front of the door. It was a small space so we each found a nook and listened to the musicians for awhile. One of the musicians was a young woman named Alissa Moreno. Alissa wrote Rascal Flatts’ song Every Day. Alissa shared a new song that will soon be recorded by Javier from the first season of the Voice. We listened to a few songs and then continued on our way. Once we got back to the hotel, we rode the elevator back up to our floor. We walked down the hallway to our room. We slid the key in the door. Once inside our room, Ann said she would go swimming if there wasn’t anyone else down at the pool. I quickly rode the elevator down to the 5th floor. I opened the door to the swimming pool room and saw that no one was there. I rode back up to our floor and walked down to our room. Once inside, I told Ann that there was no one down there. We began putting on our bathing suits. I spotted a family enter into the swimming pool area from our room. Ann said she would still go if it was just a family. We wrapped ourselves in our towels and went down to the pool area. The dad was swimming with his children; two boys and a girl. Ann and I slowly got into the pool. We swam around for awhile. Shortly after we arrived, the Dad said it was time for them to go. He looked at us and said, “We are going to go now. Then you can have some peace.” Ann and I just smiled. They really hadn’t been that loud. Ann and I swam laps back and forth from one end of the pool to the next. Every once in awhile, we would stand at the end and chat. We did this for about an hour. Then decided it was time to go back to our rooms and go to bed. We went back to our room and got ready for bed. We pulled back the covers and crawled into our beds. Before plugging in my phone and laying it on the bedside table between our beds, I quickly looked at my FitBit for the day. We had walked 10,389 steps; 4.47 miles; burned 2,552 calories and had been active for 53 minutes. After a great first couple of days, Ann and I decided to sleep in. Once we woke up, we got dressed and ready for the day. While we were getting ready, Ann and I decided to try a car service rather than a taxi since the taxi from the airport was so expensive. (The night before we had asked the person at the front desk the best way to get from the hotel to Opryland. She suggested Lyft or Uber and gave us a discount card for Lyft rides. I pulled up the Lyft app on my phone and called for a driver. Soon I received a text saying that he was outside waiting for us. (I decided that I actually prefer Lyft over Uber as Lyft shows you a picture of the car and a picture of the person, so you know who to look for!) Ann and I took the elevator and walked to the front of the hotel where our driver was waiting for us. We got into the car, put on our seat belts, and headed off to Opryland. Before we knew it, our driver was dropping us off directly in front of the Grand Ole Opry. Ann and I got out of the car and walked towards the front doors of the Opry. 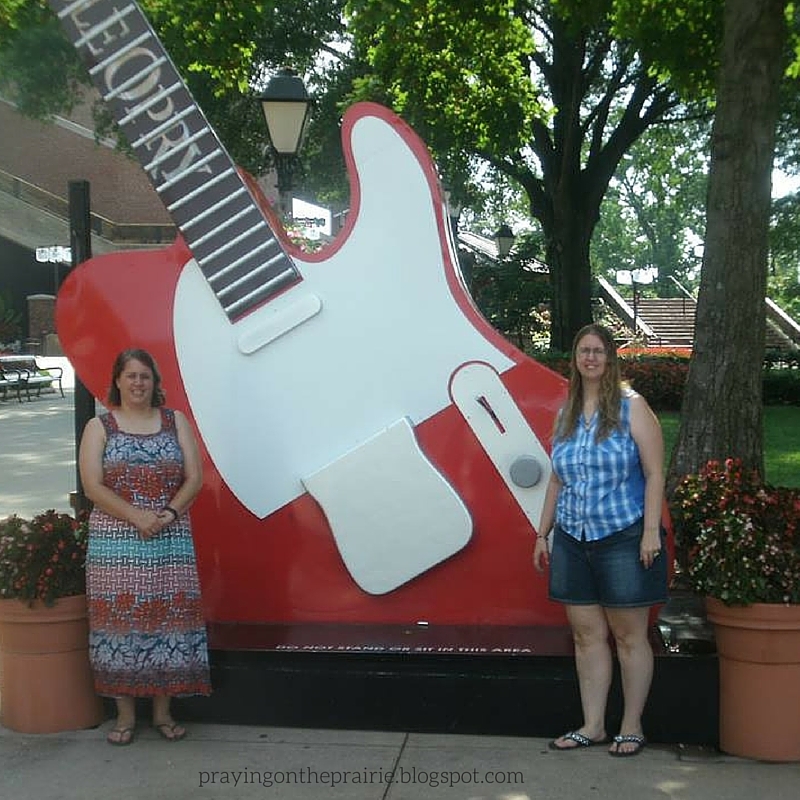 As we were walking there, we saw two giant guitars; an electric guitar on one side and a regular guitar on the other side with the words “Grand Ole Opry” written on the neck of the guitars. Ann and I were getting ready to take a few photos when another tourist asked if he could take the pictures for us. We agreed. He took our pictures and then we took pictures of him and his wife for him. After snapping our photos, Ann and I checked in at the lobby to find out where the General Jackson would be boarding in a few hours. Once they told us, Ann and I decided to check out the gift shop. The first display that caught my eye was a display of t-shirts, cds, etc for the new television show Nashville. I found a cool t-shirt with the words Deacon Claybourne written on them. I found my size and decided to try it on. Ann and I were overwhelmed with all the choices. Once we made our purchase, we crossed the street into the mall. We walked through the mall until we arrived at the food court. The receptionist had told us that the General Jackson docks directly across from the food court. We walked out into the hot August air and crossed the road. All we found was the old dock for a prior boat. We looked to our right and saw a tour bus unloading. We looked at each other and said that must be where the General Jackson boards so we turned right and headed there. We stood in line. Once we were escorted in, they asked us to go stand in front of the boat and then they snap your photo. After our photo was taken, we sat down and waited for the boat to board. After awhile, they began boarding the boat. Ann and I found our table; table 26 and sat down. A Dad and his two twin daughters from Wisconsin soon joined us at our table. We went through the buffet line where there was a plethora of choices set before us; yummy Southern food. We enjoyed our meal and visited with the family sitting at our table. After awhile, a gentlemen came by to show us our photo and ask if we wanted to purchase it. Ann and I decided to get our photo. Soon Nashville Live began. Nashville Live is a show where they sing country songs from all different generations. 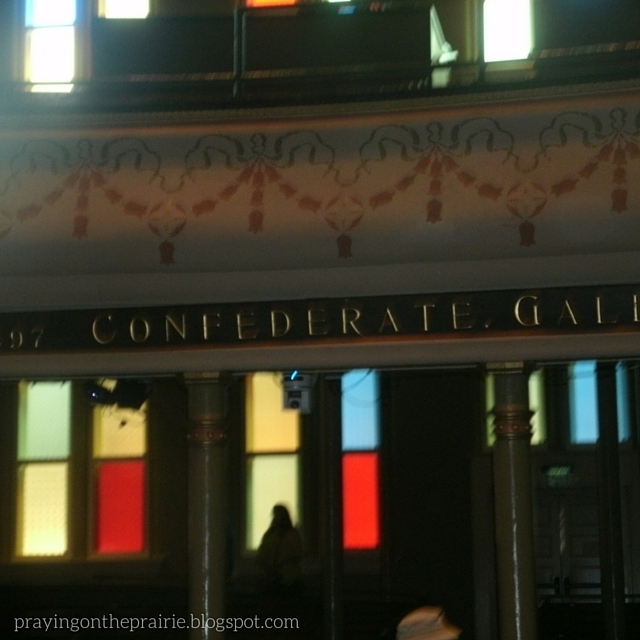 If you have ever been to North Dakota and the Medora Musical, it kind of reminded me of the musical. We indulged in the decadent cheesecake as we continued to watch the show. After about an hour and a half, the show finished and we were all invited to go stand and/or sit outside on the deck of the boat. Ann and I stood and enjoyed the view of Downtown Nashville from the boat. Soon the boat turned around and our hotel was staring right back at us. We both scrambled to see if we could get a quick photo of our hotel from the boat. Then we climbed the staircase to the gift shop where we purchased a few more souvenirs. Then we went back downstairs, sat on the deck and enjoyed the cool breeze as we headed back for Opryland. Before we knew it, we were docking the boat. We walked back to the Grand Ole Opry to see if they had any backstage tours available for the afternoon. They only had a 4 pm showing and my new friend Jen was coming to pick us up so we decided to wait until Friday when we would be coming back to attend the Grand Ole Opry. Ann and I waited patiently for a car with Iowa plates to come pick us up. We were standing on the sidewalk when I noticed a car turn into the mall parking lot. Then my phone buzzed. It was a text from Jen asking where we were. I told her we were standing on the sidewalk and I had a colorful maxi dress on. Before I knew it, my eyes spotted the Iowa plates. She pulled up into the turnabout and we got into the car. Jen had me navigate back to our hotel. After about 15-20 minutes, we arrived at the hotel. We parked in the parking garage and then went up to our room. After awhile, we decided to go pick up batteries for our cameras and then we would go explore downtown Nashville for a little bit. I entered the directions to the CVS Pharmacy in my phone and tried to navigate us to the store. However we got lost along the way. We had Siri recalculate the directions and then headed back towards where we had come from. I spotted the CVS out of the corner of my eye. It was hidden and not easy to spot…no wonder we drove by it the first time. Jen waited in her car while Ann and I ran into the store to purchase the batteries. We drove back, parked Jen’s car, and ventured downtown Nashville into yet another tourist shop. We all looked around for awhile. Ann and I decided on a few more souvenirs. With Ann’s hands full of souvenirs, she accidentally dropped an item and it broke. Luckily the store manager was very kind and told us that we only had to buy an item at that same price which we had planned on doing anyways. Soon Jen, Ann, and I were on our way back to Jen’s car. Along the way, we stopped and snapped a few photos of downtown Nashville. Before we knew it, we were back at Jen’s car. We spent some time deciding where we would eat. After a while and from a recommendation from the couple who sat with us at 3rd and Lindsley on Monday night, we decided to try out Monells. The cook came and served us all family style. We passed the numerous bowls of food around the table. There was sooo much food; pork chops, baked chicken, fried chicken, cucumber salad, green beans, cornbread, melt in your mouth biscuits and gravy and so much more. For dessert, we had yummy banana pudding. All of the food was home cooked and oh so delicious. We were stuffed by the time we left the restaurant. We couldn’t eat another bite! We paid for our meal and headed outside. Outside it was raining. We briskly walked back to Jen’s car; trying to stay as dry as possible. Jen drove Ann and I back to the hotel and then dropped us off but not before, I told her we had to snap a quick selfie together. After the selfie was snapped and once we were inside the hotel, Ann and I noticed there was a band playing at our hotel. We went to our room and dropped off our items. Then we came back downstairs and listened to this young band for awhile before heading back upstairs to lay our heads down for the night. It had been a great day. We had walked 8,237 steps; 3.55 miles; burned 2,276 calories and walked 19 active minutes. 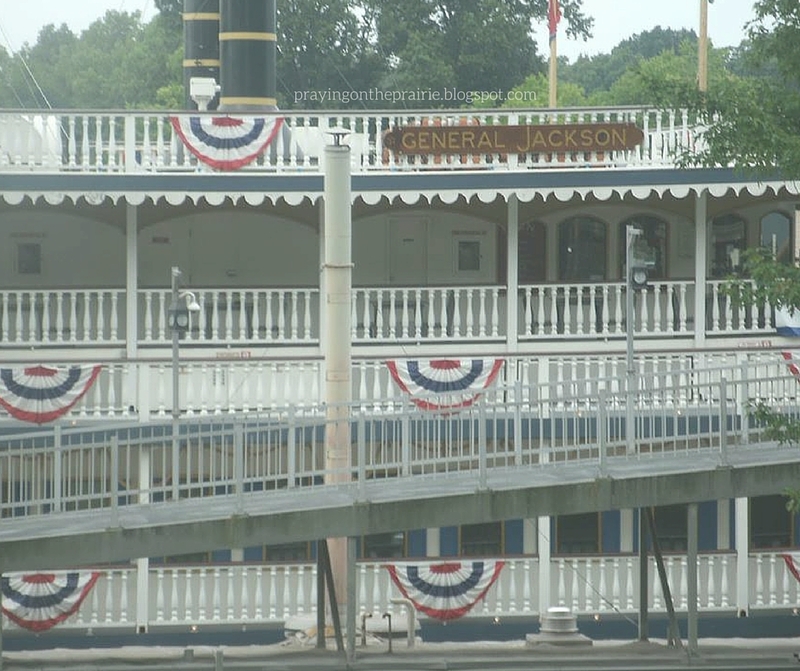 Little did we know that while we were riding on the General Jackson, there had been a shooting at a theater in Nashville. Many friends and family messaged us to make sure we were okay which we were. After a great first day in Nashville and a good night’s sleep, it was time to get up and get ready for the day. It felt so good to sleep in. After we were ready for the day, Ann and I headed out for lunch. We were headed for Acme Feed and Seed as our Auntie had recommended it to us a few weeks before we would leave for Nashville. We went out the door, turned left, crossed the street, passed the Johnny Cash Museum, and found ourselves at the corner. At the corner, we waited for the light to turn for the pedestrian light. We turned right, crossed the street, to the end of the block, turned right again and walked in the door to Acme Feed and Seed. The building was a very cool industrial building. Ann and I found a table and hopped up onto our bar stool chairs. After perusing the Menu for a few minutes, Ann and I went to get in line at the front register where we would place our order. We both ordered the Broken Spoke on their menu. After filling our glasses, Ann and I went back to our table where we waited for our lunch meal to come. Soon the waiter appeared with our beautiful plates of food. 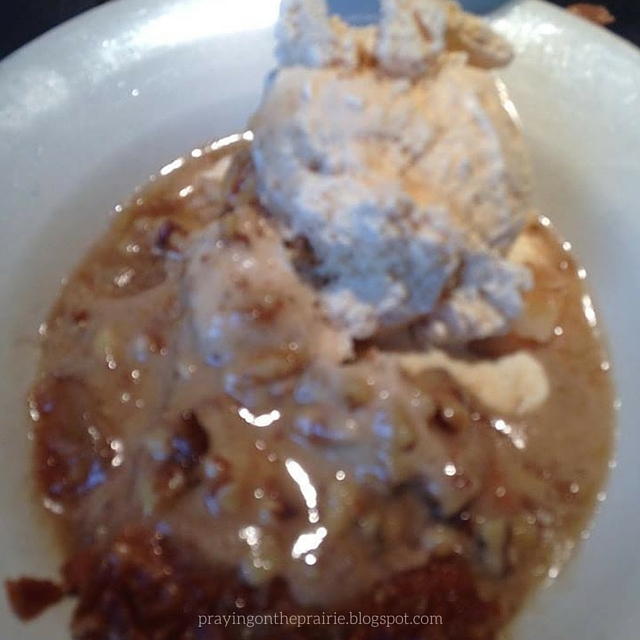 On the bottom of the plate was hand-cut fries, on top of the fries was chicken fried steak SMOTHERED in gravy. Next to the chicken fried steak was a small cup of coleslaw and fresh cut tomatoes. We took our forks and dug into our meal. The gravy was so smooth, the steak was scrumptious and the tomatoes were amazing. The juice dribbled down my chin as I took a bite into those amazing tomatoes. But it was a huge meal. Neither of us could completely finish our meals. Once done with lunch, Ann and I stopped at their little gift shop. After looking for a few minutes, we decided there was nothing that we could not have so we ventured on our way. We decided to cross the street and wind our way over to the river walk. 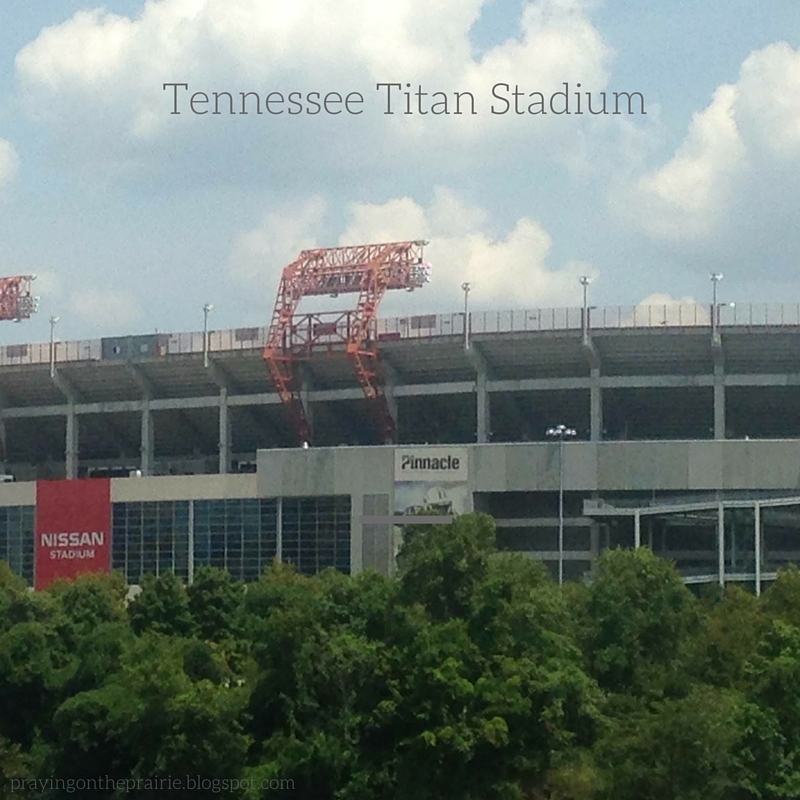 While standing watching the river, Ann’s eye caught the Tennessee Titan stadium on the other side of the river. We crossed the street back towards downtown Nashville. At the end of the first sidewalk, Ann and I turned right and found our way to the George Jones Museum. We decided it would be fun to tour this museum too so we purchased our tickets. We stood and waited for the elevator to come and then took the elevator to the top floor where the museum was. Inside the museum, we worked our way reading and learning all about George. Along the way, we spotted a recording studio where you were invited to sing karaoke. Ann and I walked inside, picked a song, and sang along with the music. We jammed out to “High Tech Redneck” with many giggles coming out every few notes as we were trying to video our karaoke to post to Facebook. We finished singing and then moved along the way. 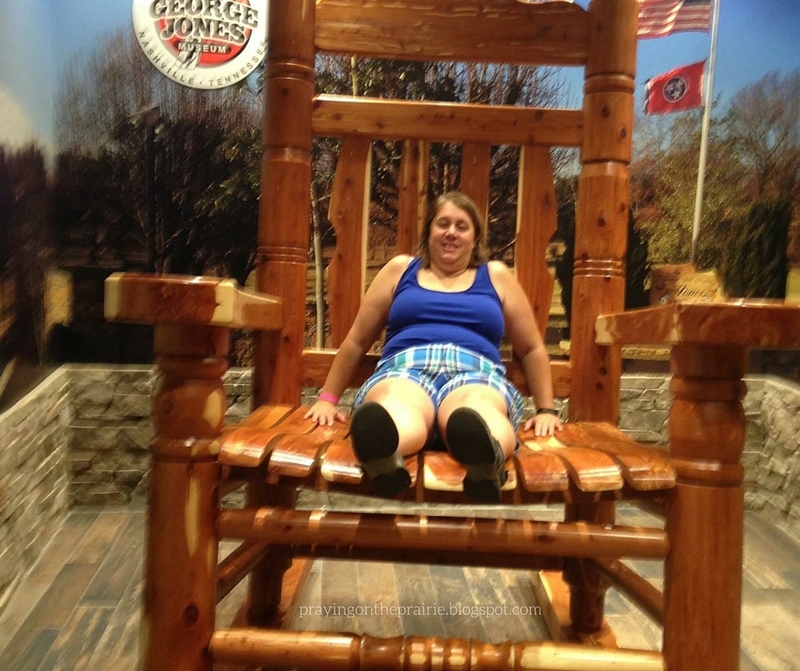 We came around the corner and saw a giant rocking chair. Ann and I both hopped up onto the chair. Then we also each took individual pictures sitting on the chair. We looked like “honey, we shrunk the kids” characters as we sat there. We continued on our way. Ann was so excited to read and see that George was a huge sports fan including her beloved Dallas Cowboys. At the end of the museum, on the wall, was a giant poster of all the artists that came out for a George tribute concert after he passed away. We rode the elevator back down to the main floor. We took our picture standing next to the statue of George. Then we spent some time perusing through their gift shop. We found a few items, paid for them, and continued on our way. We walked out the door and turned left. Along the way, as the hot sun beat down on us, we decided to stop at an ice cream shop. Ann and I each chose a smoothie. We finished our smoothies as we walked back to our hotel. At the hotel, we rode the elevator back up to our room. We turned right out of the elevator doors, then left down the narrow hallway to our door. We slid the key in the door and walked inside. We laid down on our beds and decided to chill out for a few moments. Later that afternoon, Ann and I headed for 3rd and Lindsley. When we arrived, there was no line so we walked straight inside and found a great table right in front of the stage. As we were waiting, we noticed Allison (the young woman from the Voice) that we met and her mom sitting at a table next to us. She didn’t notice us right away, but after a few moments, she saw us. A smile came across her face. She was so excited to see us. She sat down and chatted with us. After just a little while, Allison returned to her table. Her mom and her mom’s friend were visiting with a gentleman. After a few moments, Allison introduced him to us. “This is Kat Perkin’s uncle Randi.” Of course, being from ND himself, he was excited to talk to us. He even gave us a copy of his business card. We ordered some sodas and a small appetizer. Soon Allison and the other artists came onto the stage. There was Emily Minor from American Idol; a young man named Ben Rue and many other young artists. Ben sang a song about being from a small town. The words hit home for both Ann and I. After the concert, Ann and I asked him if we could have our picture taken with him so he did. After the concert, Ann and I headed back towards our hotel. We were hungry. Earlier in the day, we had talked about having supper at the Wildhorse Saloon, but on our way to the hotel from the concert decided we would save that for another day. An Italian restaurant stood next to our hotel so we decided we would have supper there. We arrived at the restaurant. We waited a few moments and then we were seated. As we looked over the menu, the price of the food caught both of our eyes. For a few moments, we wondered if we should just get up and leave, but we thought that would be strange since we were already seated. As we looked over the menu, at the expensive meals, I suggested that we get a few appetizers so that is what we ordered. Our appetizers came; four meatballs and four slices of tomatoes with mozeralla. We ate our food and then went on our way. Watching the CMA awards, our hunger got the best of us. Ann went downstairs to grab some drinks from the Starbucks in our hotel. I told her to bring us back a treat. She came back with a tea for me, a soda for herself and the most decadent cookies with Reeses Peanut Butter cups on the top. The chocolate and peanut butter melted in our mouths as we enjoyed the awards on television. Before heading to bed, I looked at my FitBit one last time for the day. We had walked 9,019 steps; 3.88 miles; had burned 2,360 calories; and walked 53 active minutes. Another great day in the books…. I am linking up with Emily Freeman’s monthly link-up for the first time today. You can check out all the posts over at Emily’s Place. 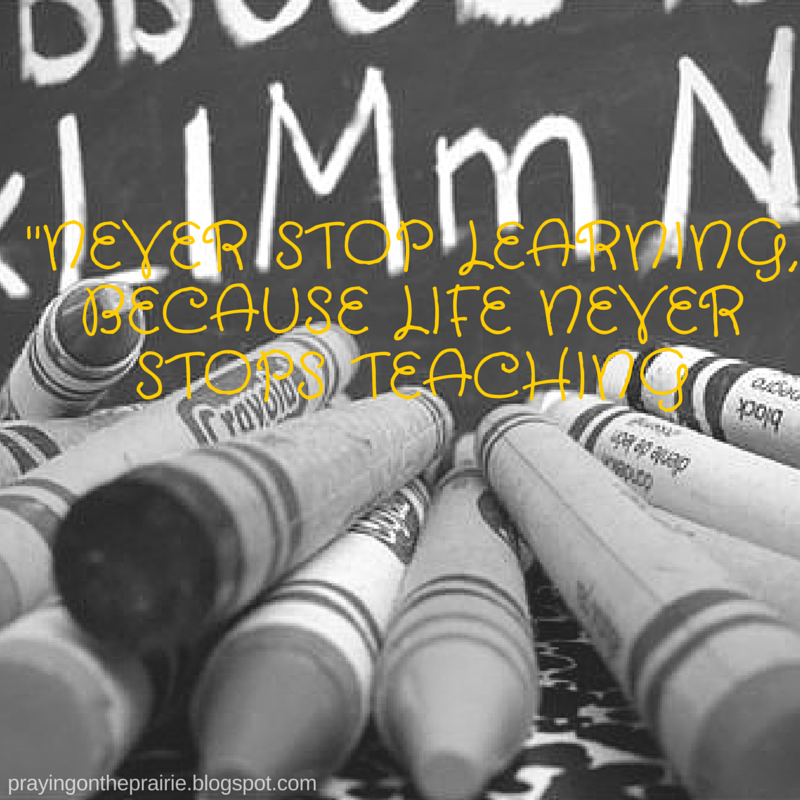 Things I learned this month…. (1) Spending time with my sister is the best! Growing up together, we were pretty good at fighting and to be honest, sometimes we still argue with each other. But there is something so incredibly holy about spending quality time together. Our Nashville sister’s trip was AWESOME and is not one I will ever forget. I love my sister so much and the time we spent together is something I will treasure for a very long time. I need to be better about spending time with those I love. (3) That twelve years after someone has passed away, my heart still aches so deeply for them. I was cleaning in my guest room when I came across the bookmark of my Grandpa’s obituary. As I read and remembered, the date (August 21) hit me straight in the gut because it was on that date twelve years ago that we celebrated his life at his funeral. Grandpa Sam was such a caring wonderful man. I miss him each and every day. (4) Sitting on my deck. 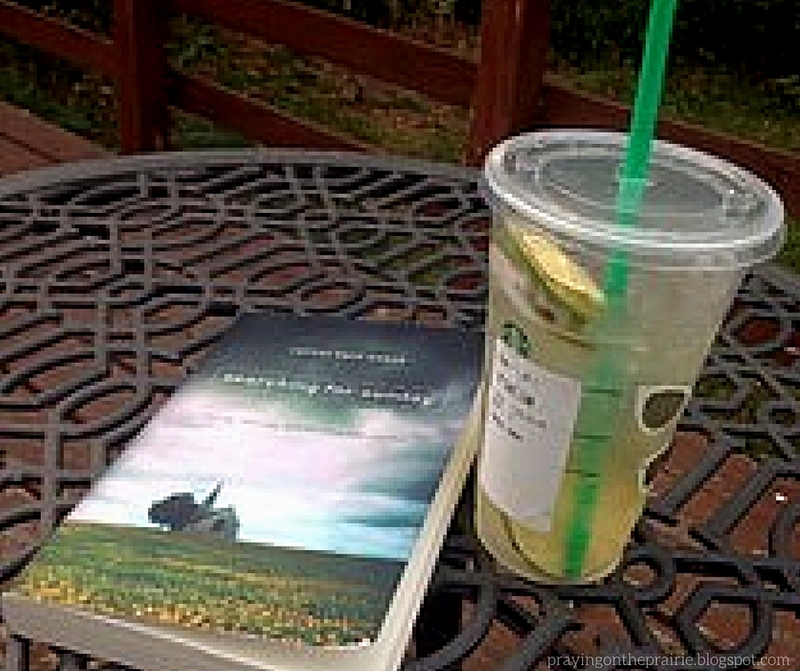 sipping a Starbucks Refresher, and reading is a place where I truly experience peace and Sabbath. I finally finished “Orphan Train”, started “Searching for Sunday” and have so many wonderful books on my to read list “For the Love” “Wild in the Hollow” etc. Since summer was so busy, I didn’t get to spend time reading on my deck a lot so I have been making up for lost time this week. (5) Periscope. I recorded my first Periscope video today and have watched several friend’s Periscopes. I have enjoyed listening to and seeing in person the people whose blogs I often read. But I still feel like I have a lot to learn. (6) VOXER! Can I say more? 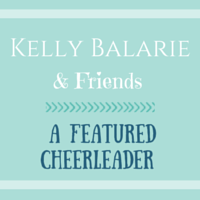 I love that I can talk to many of my blog friends and hear their voices. I seriously cannot get enough of this app. (7) It takes a lot of people and work to get a hot air balloon up in the air. Some church members called me a week ago and asked if I wanted to help them launch a hot air balloon and chase after it. This members brother-in-law/uncle owns the hot air balloon. As they sprawled out the balloon and many held on to it, I ran the fan and helped to fill it up with air. 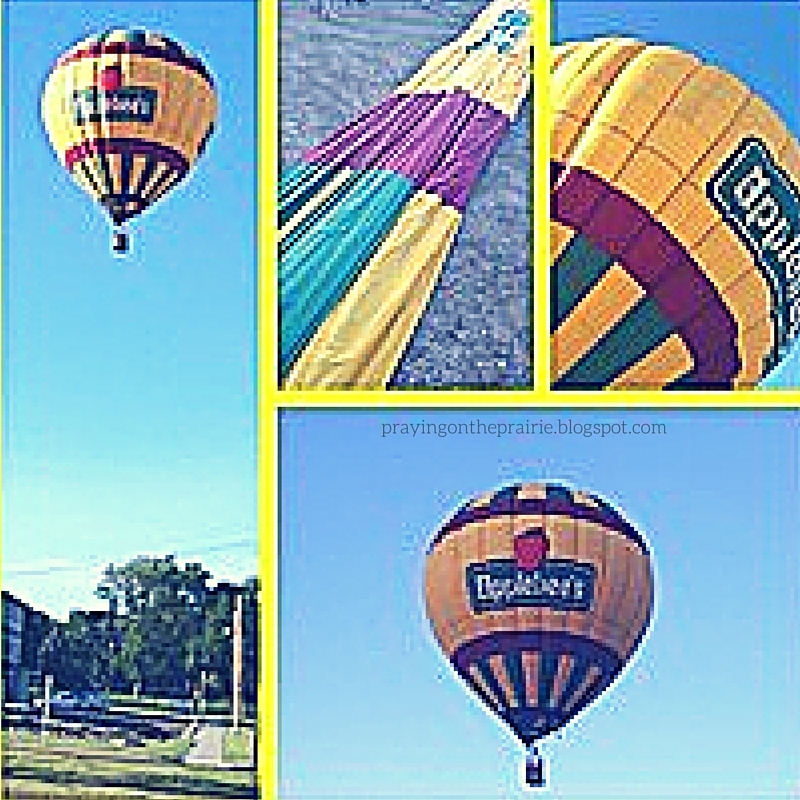 We drove around following the balloon so we could be there when it was ready to land. 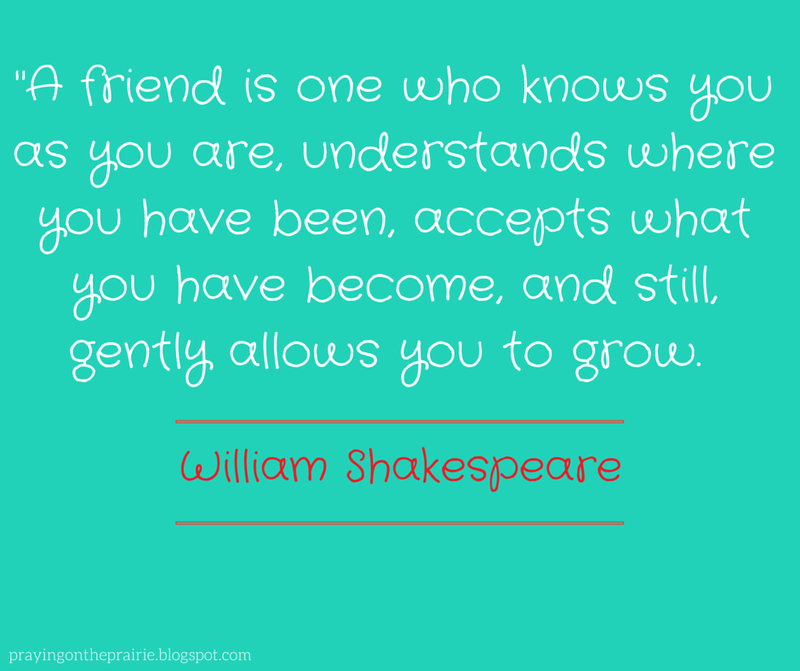 (8) A community of writers and friends who get my heart and who I feel like I have known forever. 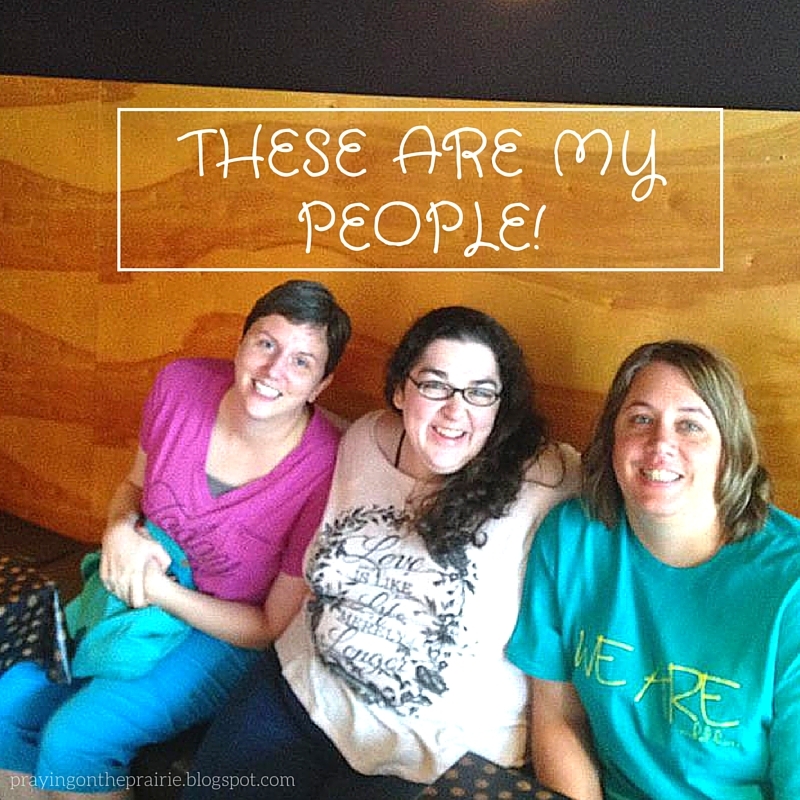 I am so blessed that I got to meet several blog friends in real life while my sister were in Nashville. It is hard to put into words how much these people mean to me. 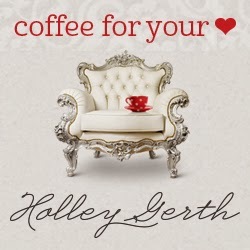 My dear friend Karrilee said it best on her blog when she wrote: “You just may find that you have found your people strung across the world wide web and you so connect in heart and spirit that distance doesn’t feel real. Yes. This. Thank You, Internet, for this!” Amen and all the yeses to that!!! (10) I love music! Being in Nashville was awesome. I cannot carry a tune for the life of me, but I love listening to new music. 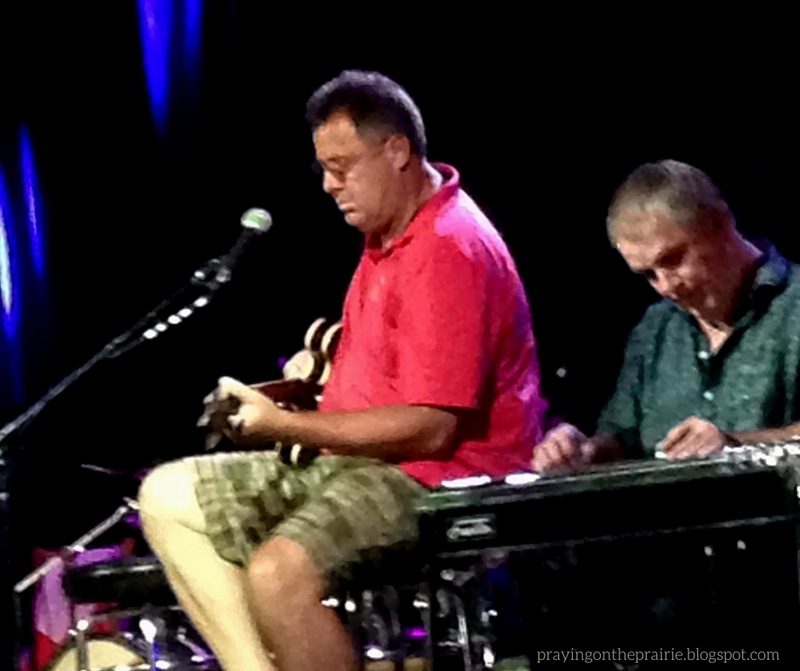 In Nashville, we got to hear all sorts of music including one of my all-time faves Vince Gill. (11) Prayer really does work! Now I have known this before and have prayed many times for others, but I was reminded again of the power of prayer. 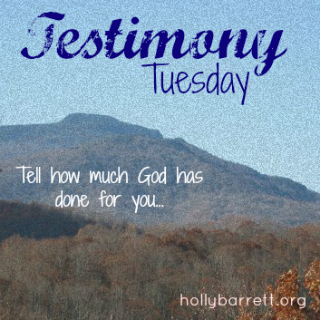 I shared a prayer request and so many of you responded with your prayers. God heard those prayers and our prayers were answered. So how might I pray for you this week friends? I would love to return the favor. 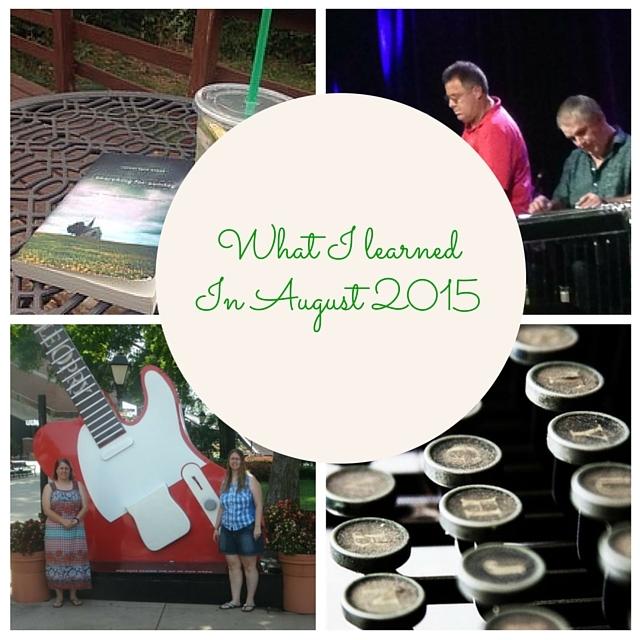 So, my friends, this is what I learned throughout the month of August. See you in September! 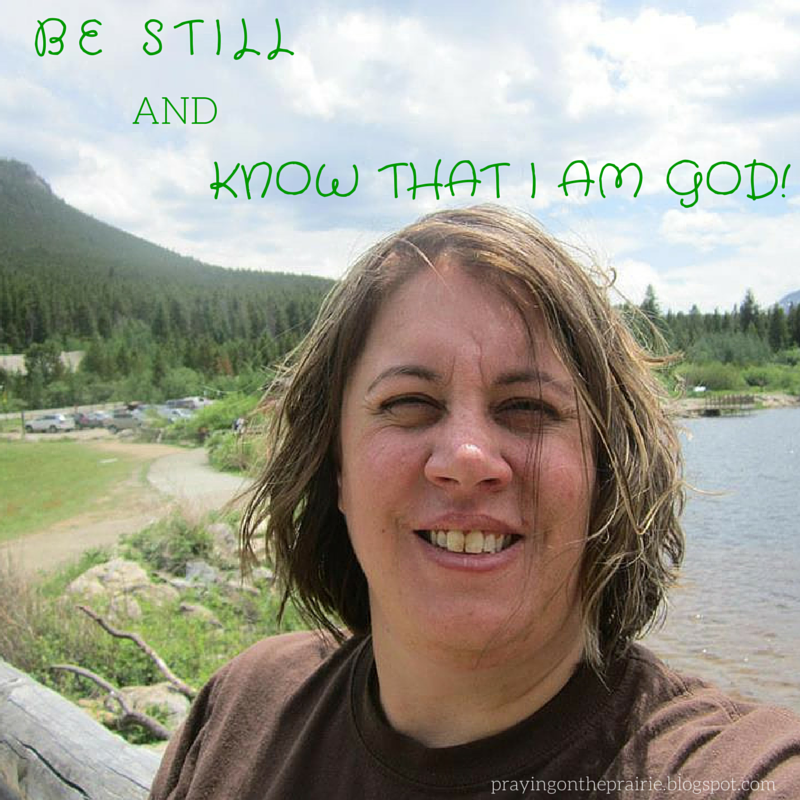 I am linking up with Emily Freeman at Chatting at the Sky, Holly for Testimony Tuesday, and Kelly for the RaRa Linkup. The other day I had so much fun recalling the details from the first day of our trip. One of my readers asked if I was going to write about the whole trip. I wasn’t planning on it. But had so much fun writing that post and hearing from all of you, that I have decided to do a weekly (no specific day just when I feel like writing) post on our Nashville Trip. After a good night’s rest, Ann and I crawled out of bed. We carefully selected the clothes for the day and got ready for our first official day in the great city of Nashville; the city of bright lights and country music. We had reservations for a tour of the Ryman Auditorium for later in the morning. After we enjoyed a nice continental breakfast at our hotel, Ann and I headed out the door. Along the way, we stopped in some tourist shops. One of the first doors we walked through was a fun little t-shirt shop. Ann spotted a yellow t-shirt with the words Nashville emblazed on it. Yellow is Andrea’s favorite color. She found a mirror in the back of the store and tried on the t-shirt. She decided she liked it so we headed to the checkout counter where she paid for her shirt. We walked out the door and turned to our left. 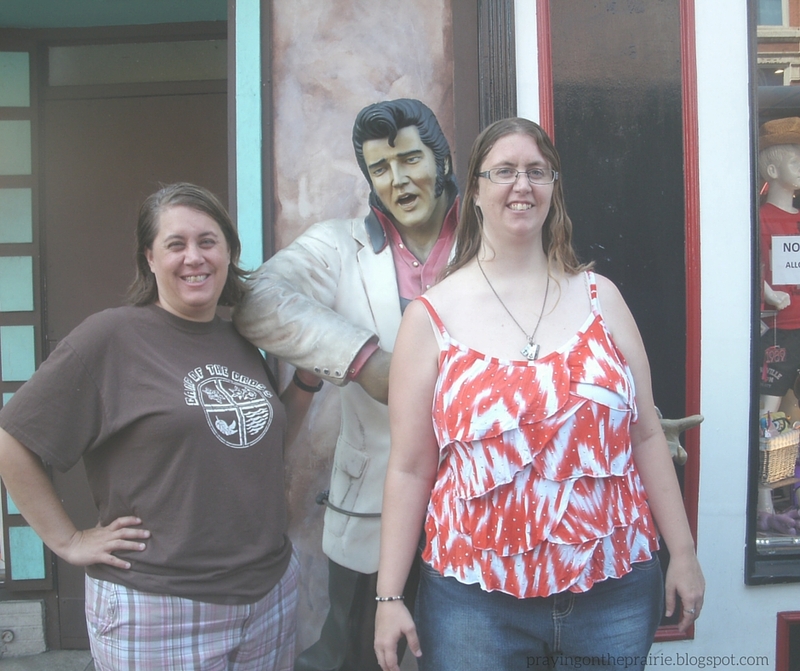 Eventually we spotted a statue of ELVIS. We asked some passer-byers if they would take our picture for us. They were much obliged and did just that. Ann and I each handed them our cameras. They snapped our pictures, handed us back our cameras and then were on their way. Ann and I continued on our way. As we were walking along, we heard a female voice say “Don’t step on that hottie.” Ann turned around to see a picture of her country boyfriend Luke Bryan imprinted on the sidewalk. She echoed the same words that the other lady stated just moments before. As we followed the map on my phone, I took a left turn passed the Bridgestone Stadium. After not many steps, I realized that we were going the wrong way. Ann asked me if I knew what I was doing. I replied that I did. We turned around and started heading in the right direction towards the Ryman Auditorium. Before we knew it, we saw the beautiful red brick building; the Ryman Auditorium standing directly in front of us. We followed the signs to the entrance; to where we would check in for our tour. Ann and I checked in and worked our way up a very ornate staircase. At the top, we waited with the rest of our tour. Eventually the clock struck 10:20 am and we were off on our tour. We huddled in closely to listen as our tour guide told us the history of that historic building. The colorful stained glass windows’ vibrant hues of red, blues, and yellows were the first item that jumped out at me. From the moment we had walked in, they had caught my eye. The tour guide continued to guide us through all the little nooks of the Ryman. 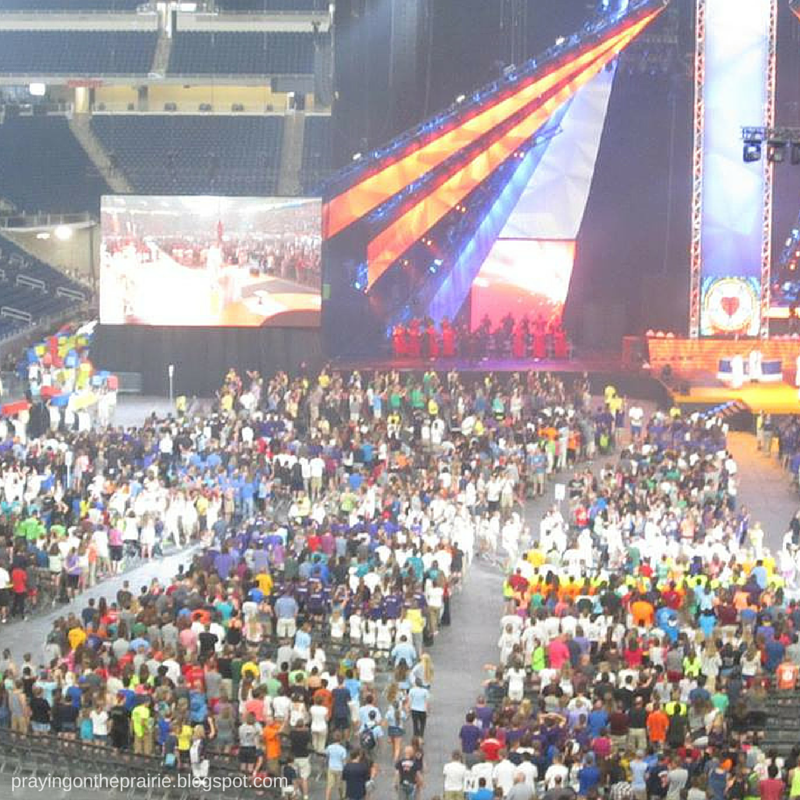 Eventually we found ourselves standing on the front of the stage smack dab in the center of the infamous circle. Ann and I decided to have our picture taken in that spot. We paid the photographer and then each picked up a guitar as he snapped our photo. On our way out of the building, our eyes caught a statue commemorating the beloved friendship of Minnie Pearl and Roy Acuff. Next to the statue was a kiosk where we picked up our photos. 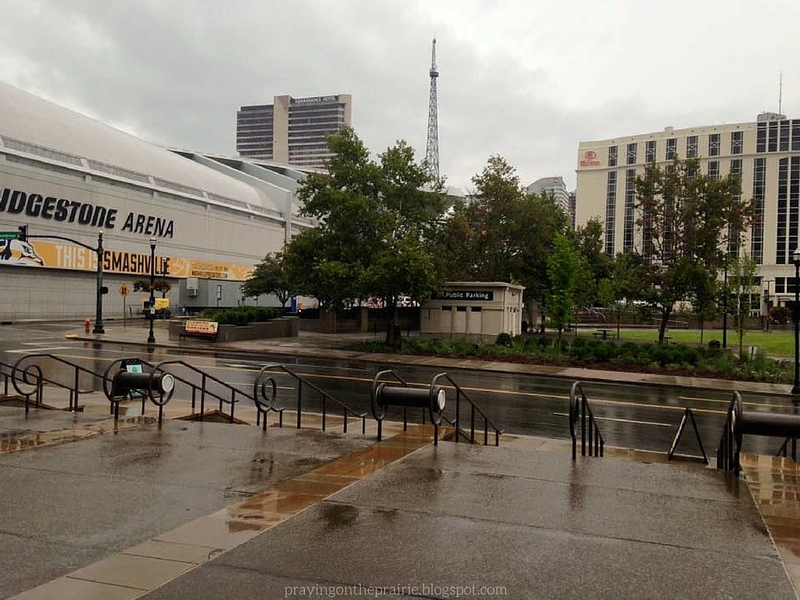 After receiving our photos, Ann and I walked back out into the Nashville air and headed straight for downtown Nashville. 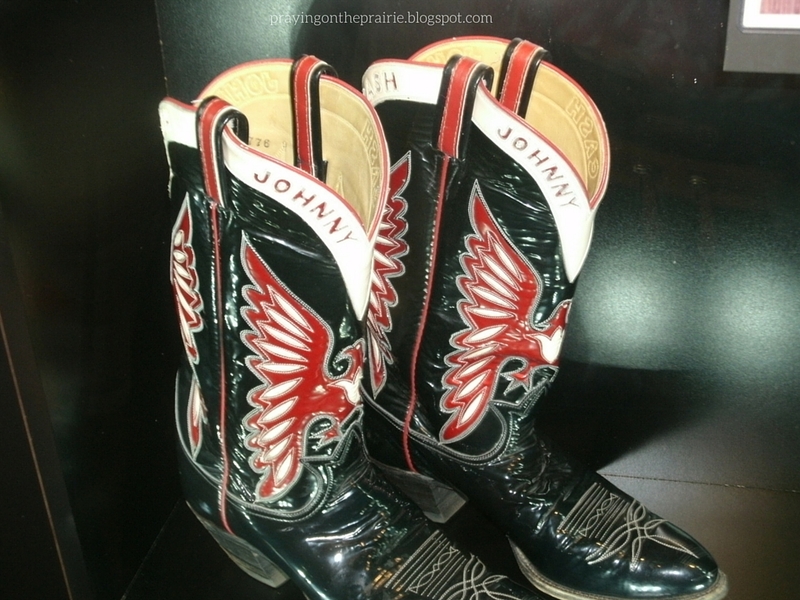 Once downtown, we decided to tour the Johnny Cash Museum. Inside the museum, Ann and I listened to the history of Johnny Cash. We were only inside the museum a few minutes when my pocket began vibrating. I looked to see who it was and knew that I had to answer it. I took care of the phone call and tried to get them off the phone as quickly as possible.After I hung up the phone, we continued on through the museum. 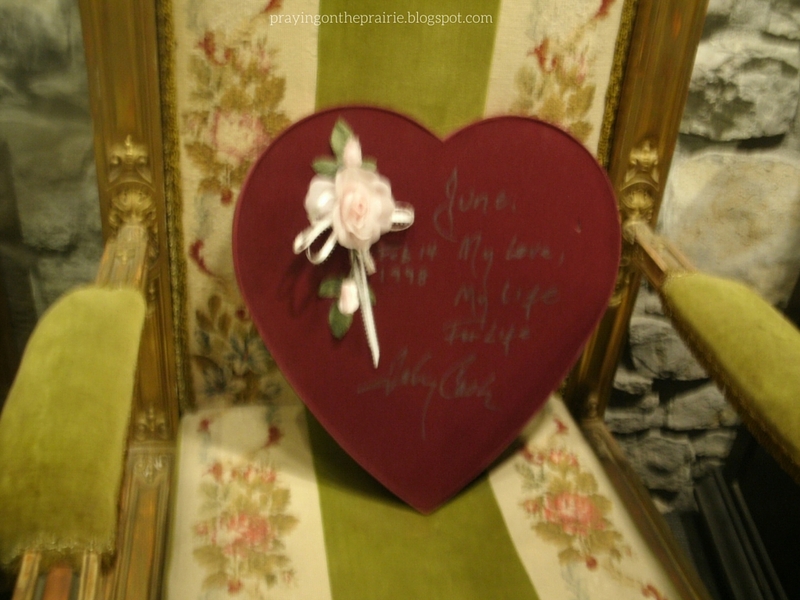 Before us were so many of his items; Johnny’s historic red, white, and black cowboy boots, the sweetest heart box given to June one Valentines Day, the collection of his albums and so much more. Once we finished at the museum, we decided to have lunch at the Hard Rock Cafe. As we were crossing the street to the Hard Rock, sirens began blaring. Ann and I looked to our right and saw an ambulance parked next to a taxi where they were carefully placing someone from the taxi into the ambulance. We moved on and went inside the cafe. Inside, we found out there was a short (15-20 minute) wait so we waited. Before we knew it, our buzzer was blinking and we were being seated. Ann and I perused over the menu and placed our orders. We each decided that since we were on vacation, we would indulge in an adult beverage. Mine was this southern tea that came with a cucumber as the garnish. I didn’t realize it was a cucumber until I pulled it out of my glass. The drinks were way too strong for us that most of our drink stayed in our glasses on the table. After we finished our meal, I went to pick up my souvenir; a Hard Rock cafe mason jar. Then Ann and I headed to the larger Hard Rock store next to the cafe. Ann found a cute teddy bear that we decided to purchase for Mom. We named him “Nash”. Ann also found herself a t-shirt. Once our purchases were made, we headed back outside. The hot sun beating nicely against our skin. We turned right down the sidewalk passed many historic Nashville bars. We quickly spotted the Wild Horse Saloon. But unfortunately the sign outside said they were closed until 4:30 pm for a private function. We had a few photo ops with the horse outside the Wild Horse and then ventured on our way. We walked back to our hotel. Ann and I rode the elevator to the 7th floor. We got off, turned right, then left down the hallway to the door of our room. We slid the key into the door. Inside our room, Ann and I changed into our swimming suits. Then we rode the elevator down two floors to the 5th floor where the swimming pool was. The water was cold so we slowly took one step at a time into the water. Once in the water, after a few moments of moving around, the water warmed up. Ann and I raced each other from one end of the pool to the next. It reminded both of us of the many times we went swimming with our neighbor kids growing up in small town North Dakota. Ann got out of the pool, wrapped herself in a towel, and took a quick photo of me in the water. Swimming was a great way to cool off on a hot Nashville August day. After drying off, Ann and I headed back upstairs to get ready for our night. A friend had recommended to me a place called “3rd and Lindsley” so we had purchased tickets to see the Time Jumpers play there later that night. We left our hotel at approximately ten minutes after five. The doors at 3rd and Lindsley opened at 5:30 pm. By the time we walked the three-four blocks there, the doors were already opened. Ann and I weaved our way through the tables and chairs trying to find a great spot to sit. We came to a table where two other couples were seated. They asked us if we wanted to sit with them and we said sure. The older couple across from us told us all about the Time Jumpers, Vince Gill and so much more. Even though the doors open at 5:30 pm, the band didn’t come on until 9 pm. We introduced ourselves to all the individuals at our table. We found out the husband from the other couple drives bus for many of the stars. Throughout the evening, we conversed with each other and found ourselves munching on appetizers to pass the time. As we were passing the time, Ann turned to me and said “That girl over there was on the Voice.” I thought she was silly for thinking that. I said “Why don’t you ask her?” But Ann was too chicken she kept asking me to ask her, but I wasn’t going to give in. But then my curiousity got the best of me and I asked her. She was indeed on the Voice. Her face lit up when she realized that we knew her from the show. Her name is Allison Bray. Allison then came and took pictures with both of us. She also invited us to come back tomorrow night as she would be singing as part of a young country showcase. Around 8:30 pm, Vince wearing khaki green shorts, a red polo top, and slip on shoes, walked onto the stage with his guitar. He quickly checked his sound and then went backstage. This girl who has loved him her whole life was totally fan-girling!!! Soon the clock struck 9 pm and the Time Jumpers along with Vince came onto the stage. Their music filled the room as we all listened intently. Then one of the band members introduced Vince by saying “This guy has done everything in the book and then he joined a band he knew nothing about.” Laughter quickly filled the room. A smile formed on Vince’s face. Vince’s smooth voice began belting out one of his beloved songs. Goose bumps began to form on my arms as I listened to him sing. His voice filled the room and covered us in the deep warmth of his vocals. I seriously didn’t want the singing or the night to end. After an hour, they took a break. Ann and I went over to their merchandise booth and bought a copy of the Time Jumpers CD. Thirty minutes later, the Time Jumpers including Vince came back onto the stage. They invited a few young artists to come up on stage; one of them being Crystal Bowersox from American Idol. At midnight, Crystal was turning another year older and some friends had given the band her name. Crystal came onto the stage, hugged Vince, and then together Crystal sang with Vince and the Time Jumpers…a birthday I am sure she will never forget. At 11 pm, the concert was over. We were sad to see it end. Ann and I walked quickly back to our hotel as it was dark out. Once at the hotel, we rode the elevator back up to our room. We slid the key into the door and stepped inside. I looked at the FitBit on my phone. We had successfully walked 10,650 steps; 4.59 miles; burned 2634 calories and were active 74 minutes. It had indeed been a successful first day! Our Trip Was Only Just Beginning…. Joining in with the online discussion on the book “On Being A Writer” by Ann Kroeker and Charity Singleton Craig. Today we are working through Chapter 4: Notice. Why is noticing important? How can we improve our noticing skills? Why and how does noticing enhance our writing lives? I carefully packed my clothes away in my red suitcase. After double-checking our lists, I zipped up the suitcase and set it against the wall. My sister’s lopsided suitcase with the broken off leg leaning gently against my suitcase. My alarm clock rang with its annoying buzz the next morning as I headed off to worship. Dear sweet children gathered around my feet for the children’s sermon. After worship, we headed down stairs past the quilters room and Brides room into our gathering space. We sat and broke bread together. The hours after worship seemed to crawl by much like a very slow turtle. Finally the clock struck 2:30 pm. A text from my dear friend CT came through on my phone. She was on her way to pick us up. Ann and I stood by the door, suitcases by our side, waiting not so patiently to get our adventure started. CT arrived. I quickly locked the doors to my house. Then we loaded the carefully packed suitcases into her car. She dropped us off at the airport but not before wrapping each of us in her arms as she hugged us goodbye. CT drove off and Ann and I stood in line. I successfully went through security while Ann was taken off to the side. Not exactly sure why she was pulled out but after a quick check, she was also waved through. We each grabbed our items out of the security bins and slipped our shoes back onto our feet. Then we found our seats and waited for our flight. Finally the plane arrived and we began boarding for our flight. The first half of our flight from Minot to Minneapolis was extremely short just enough time for the flight attendants to pass out snacks and beverages before we were descending down into Minneapolis. After landing, we got off the plane and walked from our current gate to our next gate and almost immediately began boarding our flight for Nashville. After finding our seats, we soon were taking off. I grabbed onto the chair in front of me until we were at our cruising altitude. In the air, we looked out the window. 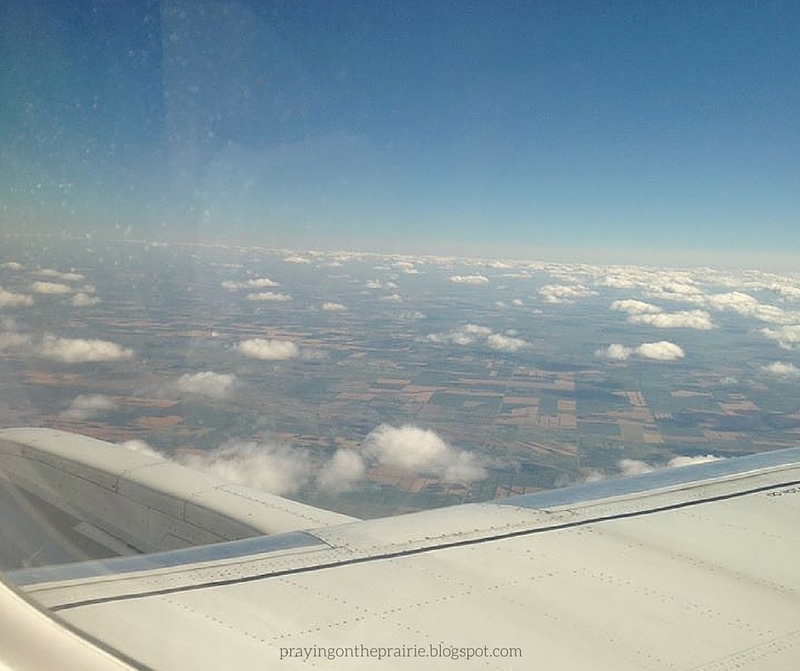 A sea of fluffy white marshmallow clouds was sprawled out in front of us. It felt like we could reach out and touch them. Soon we were descending into Nashville. After landing, Ann and I found our way to baggage claim where we picked up her lopsided suitcase. I had carried my suitcase onto the plane as a carry-on. After a few moments, Ann spotted her suitcase. She wound her way through the crowd of people waiting and grabbed her suitcase. 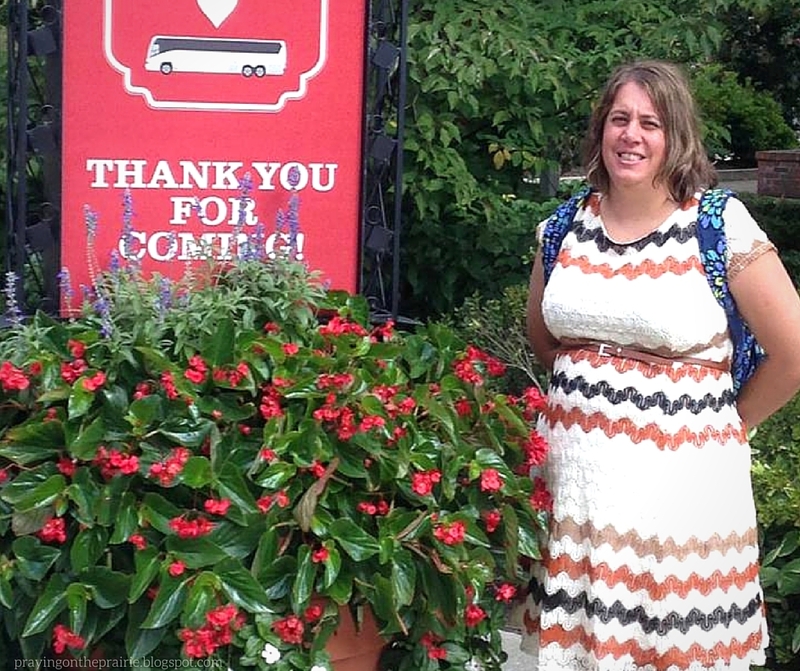 With suitcases in hand, we walked out into the hot humid August Nashville air. Luckily we found a cab waiting area and there was no one in line. The attendant told us the cost of the cab ride $26, loaded our suitcases into the cab, and then the cab driver opened the door for us. We got into the vehicle and sat down. On our way to the hotel, the cab driver asked us where we were from and if this was our first time in Nashville. As we drove along, we sat glancing out the window, taking in the sights and sounds of this new place we were now visiting. Before we knew it, we arrived at the hotel; the Hyatt Place which is only three years old and used to be a parking garage. 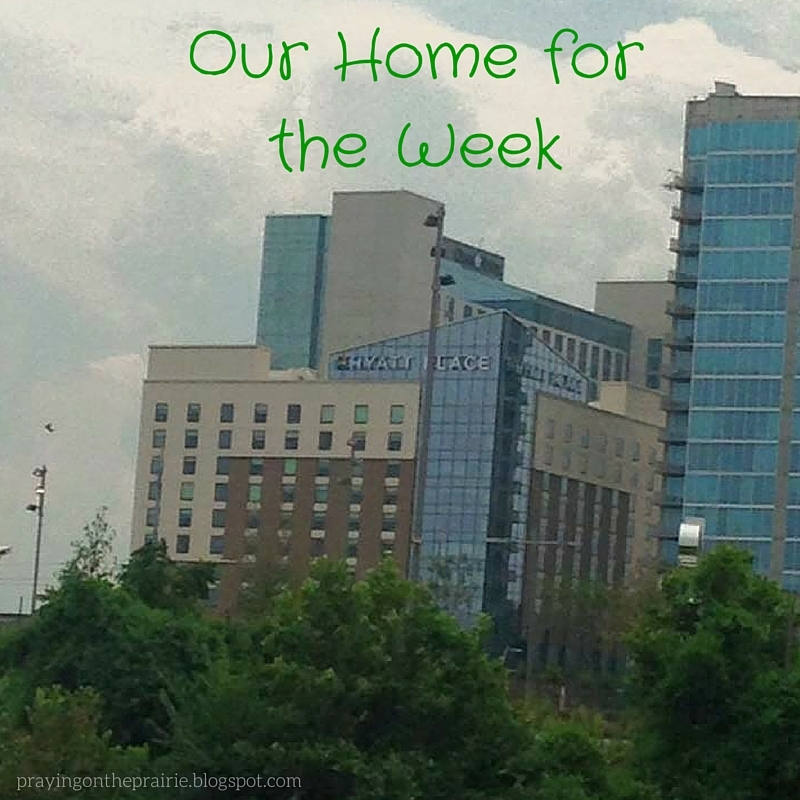 It was so close to downtown Nashville that we could walk everywhere. A concierge was waiting on the sidewalk as the taxi driver pulled up. The concierge pulled our suitcases from the taxi. We paid the taxi driver and thanked him for our ride. Through the glass doors, we entered the hotel into the lobby of the hotel. In front of us, behind the front desk, stood this wall full of words describing the city of Nashville: music, bright lights, etc. We took in the wall and our new surroundings as we waited. Finally we were next in line. And we soon were checked into our hotel. With our keys in hand, Ann and I wheeled our luggage…well kind of wheeled since Ann’s one leg was broken off…to the elevator. We pushed the round button for the elevator to come to us. It came. We stepped into the elevator and pushed the button for the 7th floor. The elevator ascended. We stepped out of the elevator, turned right, and then turned left down a long narrow hallway. Soon we arrived at the door to our room. We slid the key into the door and opened the door. Ann and I sat down our luggage and inhaled the landscape before us. Right as you came in the room, the bathroom was to our right. Taking a few more steps, there was a couch set before us much like a living room. On the bottom shelf of the bookcase, lay a hard covered book about Nashville and its many sights. On the top shelf, lay a soft white blanket. Standing next to the end of the couch was a room divider. On the other side of the room divider were two queen side beds with an end table between them. On the opposite wall was a closet. Next to the closet was the television which stood on a dresser. There also was a small refrigerator which stood on floor near the dresser. Next to the dresser was a full length mirror. Next to my bed was a huge picture window. With the curtains open, the view out that window was the view of a rooftop pool at a neighboring hotel. Next to the closet was a little nook. That empty space next to the closet became the place where all of my belongings were sprawled out throughout the week…my suitcase, souvenirs, my shoes and the list goes on. The space next to the couch became the area where my sister laid out her belongings during the week. After a long day of traveling, our stomachs were growling for food. We took the elevator down to the hotel lobby and to the restaurant/bar in the hotel. We perused over the menu and then placed our order; a cheese quesadilla. The waiter asked us where we were from and we told him North Dakota. He smiled back at us and said I can tell. (Apparently we had a pretty prominent accent!) Our order came. We bit into our food; the ooey gooey cheese tasted so good in our mouths. We quickly devoured our food. Once our meal was finished, we rode the elevator back up to our hotel room. After sliding the key in the door and entering back into our room, we changed into our pjs, pulled back the covers, and crawled into our beds as we drifted off to dreamland. Waking up refreshed and renewed for what would be an epic joy-filled fun week in Nashville together. Our trip was only just beginning…..